Is Your Womb A Toxic Environment? I’ve been working with one my private fertility clients to release the fear that her womb is a toxic environment and that even if she does get pregnant, she will only miscarry. To help her shift out of this awful feeling place, I encouraged her to consider what the opposite of a toxic environment was. Warm, welcoming, inviting, nurturing, nourishing and safe. A place you want to share with loved ones. The way you would prepare your home when you’re inviting friends over for dinner. That’s a very different feeling and image from a toxic environment. But if your body hasn’t been able to conceive or you’ve had one or many losses it’s natural to feel like your womb is hostile rather than welcoming. It’s understandable that you would be angry and disappointed with your womb. How then do you create a feeling of hearth and home within your womb centre? Changing your relationship with your womb begins with changing your relationship with your menstrual cycle. Especially since your period is the first connection you ever had with your womb. What was it like for you when you got your period the first time? Over and over I hear this story: Your mother gave you a pad and told you how to use it (and you could tell she was uncomfortable about the whole thing). Then she told you to be careful around boys because now you’re a woman. And that’s pretty much it. You never talked about it again. You probably complained to your girlfriends and sisters about what a pain your period was and exchanged pads, tampons and midols. And you probably spent many years trying not to get pregnant. So really, you and your womb aren’t particularly close. And if you’ve had painful periods you might even hate your menstrual cycle. Your period is likely a nuisance you’ve managed for at least two decades and now that you’re trying to get pregnant it’s become a source of disappointment and failure. Consider this: If you had a strained relationship with a childhood friend would you pick up the phone after 20 years and ask for a big favour? Probably not. So how do you transform your relationship with your womb from one of ‘I’ll put up with you because I have to’ to a friendship where you feel close, connected, secure and loved after all these years and make a baby together? 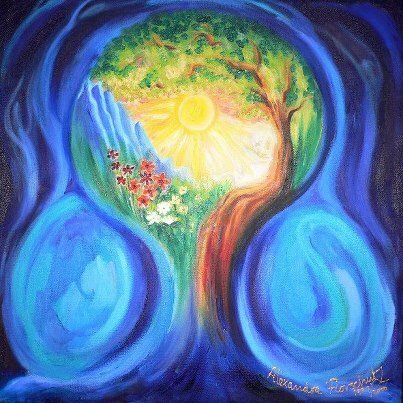 Through your menstrual cycle you have access to four feminine energies. They are the Go-getter during pre-ovulation (the follicular phase), the Nurturer during ovulation, the Enchantress during the pre-menstruation (the luteal phase) and the Wise Woman during menstruation. Each of these goddess energies give birth to a special part of your feminine being. And your goddess energies give you access to relate to your womb far beyond the goal of trying to conceive and yet support you in that very endeavor. Don’t you notice that right after you period your mind clears and you have a surge of energy? Meanwhile days before you felt down in the period dumps? That growing energy comes from estrogen rising in your body and in turn gives rise to the Go-getter; the goddess energy that gets you back into action, renews your hope and gives you a fresh start. Mid-cycle when estrogen peaks in the body and you ovulate is when the Nurturer goddess energy comes to life. The Nurturer gives you the opportunity to connect with your heart and womb and open the channel of conception. If your relationship with your womb is damaged this is the time to heal and nurture yourself. Before you can welcome a baby into the sanctuary of your body, you need to feel your womb as a safe space. After you ovulate, progesterone begins to rise and your energy starts to wane. Like the darkening moon, your energy grows heavy and draws you away from the mundane world towards your inner world; the world of your thoughts and feelings. The luteal phase forces you inward for a purpose – so the Enchantress goddess energy can weave her magic. This phase is when your innermost fears and hearts deepest desires come up for you to determine whether you feel in sync or out of alignment with your soul. Instead of searching on line for the answers, take time to journal and reflect on whether your actions reflect your values. Are you telling yourself you ‘should’ be doing an IUI, or you ‘should’ be doing an IVF when your body needs time to grow healthy? The Enchantress will show you the best way forward through your emotions, especially if you’re feeling alone and unsupported just listen deeply. She wants you to take a stand for what you really need to receive from this journey, not to torture you but to transform your life so you’re being true to yourself. Finally, with the descent of your menstrual flow brings forth your inner Wise Woman. It’s time to let go. What thoughts, beliefs, behaviours and fears are no longer serving you? Let them wash away with your period. Cleanse yourself, learn your lessons and start freshly renewed for the cycle ahead. Good! Because this is your chance to embrace your four goddess energies, forge a healthier relationship with your womb and restore faith in your body’s ability to conceive with Moon Goddess. 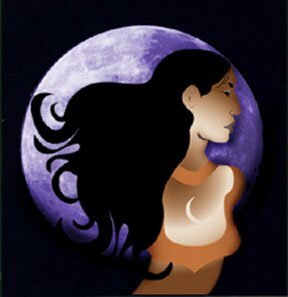 50% of my clients have conceived using the Moon Goddess wisdom so why not you too? If you’ve been trying for more than a year, and you’re on the verge of seeking medical fertility treatments. Or you’re well on your way doing rounds of IUI or poised to do your first (or subsequent) IVF, stop. Before you go any further, check out Moon Goddess. I have seen so many of my clients use this program to conceive – half of them naturally and half of them with assisted reproductive technologies – 50% of Moon Goddess graduates have gone on to conceive and carry a healthy pregnancy. Moon Goddess is a fertility-enhancing yoga & meditation practice that improves your chances of conceiving by 50%. Right from the comfort of your own home and at a price point that is easy to say yes to. Check out Moon Goddess and prepare for your miracle.